Recently, this quote from Buddhist teacher Pema Chodron caught my attention. I recognize this pattern. This what I experience as I follow the Moon through its phases—things come together and they fall apart every lunar cycle. The Moon counsels how to make room for this pulsation of emotion and experience. As the Moon waxes and wanes, I follow an intention through a variety of emotion, relief and joy as well as misery and grief. I appreciate Chodron’s teaching of non-attachment. I can allow all these feelings space to move through by making more room for them inside. The Moon shows me that whatever I am feeling in the moment will eventually pass. The influence of the Moon is always strong, but is even more so during the Cancer lunar cycle,* which is ruled by the Moon. We have the opportunity to develop stronger relationship to the cycles of coming together and falling apart this month. Chodron writes that “healing comes from letting there be room for all this to happen.” This resonates. I want to learn how to make room for emotional experience evoked by these cycles of coming together and falling apart. I imagine that this inner spaciousness of acceptance is my true home—the place I allow myself to be and feel all that is true to me. After all, Cancer is the sign of the home, both external and internal—but especially internal. Think of the crab, covered in a hard shell, always at home and always turning attention to what is inside the shell. The season of Cancer is time to let the waters of emotional awareness turn our gazes inside as well. This investigation has added potency this month. Jupiter has spent the last year in Cancer and will be leaving this lunar cycle to spend the next year in Leo. Jupiter is the guru of the solar system. Steadily throughout the year, Jupiter’s been teaching us about home. What spiritual truths have been revealed to you? In astrology, all symbols are literal and metaphorical. As Jupiter prepares his final illuminations, will you join me in turning our gazes to the inner home where healing is found? This is not a simple pursuit. Masterful teachers like Pema Chodron have dedicated their lives to it. But as she says, it isn’t about passing the test or overcoming the problem, it about letting there be more room. Sunday, June 29. Mixed messages could challenge our composure today. In the central time zone, we have a night of dreaming inspired by the trine between the Sun and Neptune. We start the day sensitive and open, perhaps ready to bring healing to a wound. Then, the stressors and possible conflicts kick in around how to really help. Venus in Gemini enjoys more social, light-hearted interactions. This impulse rubs up against those whose emotions are more raw and unprocessed. To top it off, boundaries are not as clear as they could be. Step back from assumptions and ask for clarity. By the evening, we just want to let off steam, which could be a good thing. Monday, June 30. The whole week is influenced by the direct stationing of Mercury. Planets become stronger when they change directions. Mercury in Gemini is preparing to turn direct tomorrow. Strange communication and travel mix-ups are possible. However, we can invite a sense of curiosity and humor to help us through. The Moon in Leo energizes us to take creative action. Not much patience will be in evidence. Considering the trickster energy of the day, things may not turn out the way you thought they would, but can you accept that there are hidden benefits in the confusion? The square between the Moon and Saturn contributes to the wish that we could have more control over outcome. The task will be to more room for delight and disappointment. July 1—Crescent Moon: Beginning. Have you been able to give more room to the feelings that are arising for you? This phase of the Moon encourages us to begin practices in support of manifesting intention. We dare to act as if our dreams are indeed possible. What practice or action will support inner acceptance as we get in touch with deeper feelings? A persistent challenge for the next few days will be the pressure of perfectionism in the face of chaos. The Moon will stay in Virgo for almost three full days, while Mercury stations direct. No matter how hard we try, and we will try, we will not achieve perfection. Mercury rules Gemini and Virgo. In Gemini, like a magician, Mercury delights in slight of hand tricks. In Virgo, like a librarian, Mercury delights in creating systems of order. What a split personality this god has! Even though Mercury can bring stress and upheaval, we’d be lost without this inventive, clever ally. What new point of view has Mercury given you in the past three weeks? This kind of expansion makes more room for our true selves. Give thanks. Wednesday, July 2. Virgo is the sign of the dedicant. The Moon in Virgo asks us to become a dedicant in service to hearth and home. Remembering that home can mean both our physical and metaphorical homes, what is the state of your true home? How will you dedicate yourself to this home? What acts of beauty and strength will honor this home? Housecleaning goes deeper than we think. Sweep out the old and invite in the new. Thursday, July 3. One feature of a Mercury retrograde period is the clean up after it is over. Miscommunications, system breakdowns, car and computer troubles, all these kinds of things are sorted out as Mercury turns direct. The Virgo Moon encourages us to take care of such details. What new systems will bring more ease into your life? Many will be planning for the 4th of July holiday tomorrow. Even if you have the day off, you might still want to work. It feels better to get things in order. Disagreements with partners may involve misunderstandings about power and commitment. Growth happens when we begin to see the other’s point of view. Friday, July 4. U.S. Independence Day. For the first time since the United States gained independence, Pluto is transiting opposite the nation’s Sun in Cancer. The Solar Return for the U.S. shows this Pluto/Sun opposition right along the Ascendant/Descendant angles of the chart. This will be a year of accounting for our actions and impact in the world. It is also a year where, as a nation, we can heal power imbalances. To add to this powerful transit, the square from Uranus brings a desire to upset the status quo. History is impatient at the moment. The U.S. has always been a Cancer nation. Patriotism and protectionism are strong manifestations of this energy. However, we can also use this same energy to ensure that every being thrives through broadening our notion of what it means to nurture all. This Pluto/Uranus transit represents being at a crossroads for the U.S. The choice before us: How will we use power? How will we take responsibility? The collective choices begin with personal ones. How do you use power? How do you take responsibility? July 5—First Quarter Moon: Manifesting. At the Crescent phase, we begin a practice in support of intention. At the First Quarter Moon, we face an obstacle to manifesting that intention. Remember what Pema Chodron wrote about how “things don't really get solved. They come together and they fall apart. Then they come together again and fall apart again.” This happens with intention and mindfulness practices too. Obstacles are not always a sign of failure. If the goal is to make a home for everything that arises in us, then even the obstacles are helping us. The Moon in Libra encourages equilibrium. Big transits to Pluto, Uranus, and Mars today from the Moon may challenge that sense of balance. Hearts are growing. We learn new ways to support each other. If it is true that the mutable signs (Gemini, Virgo, Sagittarius, and Pisces) loosen the screws so that the cardinal signs can initiate the building of new structures, then next month should contain interesting developments. Screws have been loosening a lot during this Gemini lunar cycle. * Have you noticed yourself scrambling to adjust to the unexpected? Spending more time gathering information to keep a handle on things? Redoing and redoing only to surrender expectations anyway? Many of us aren’t comfortable with long periods of dismantling. It can feel too vulnerable to let it all hang out for too long. The discomfort is shown in how much astrologers talk about Mercury retrograde. You’d think the world just ended because our computers aren’t working properly, or someone misunderstood what we were trying to say, or travel plans got mixed up. The more uncertainty during mutable times, the more likely people will respond reactively to regain control when the cardinal signs (Aries, Cancer, Libra and Capricorn) kick in. It is good to be mindful of this stress and this possible response when Sun and Moon join together in Cancer at the next New Moon on June 27. Cancer dives under the surface of our discomforts. As a water sign, Cancer touches upon the deep recesses of the sub-conscious where very old memories wait to activate very old patterns. The overarching mission of this Cancer instinct is to create safety and provide nurturance. Cancer calls upon every ounce of instinct, whether it comes from the sub-conscious or the latest Good Housekeeping magazine, to insure that we are cared for. This is an instinct to be cherished, as many of us do. Without Cancer, we are unmoored. Having just spent a month of loosening screws, we are ready to find home base again. That desire is primal and will influence actions and reactions during the next lunar cycle. But first, we need to complete the Gemini lunar cycle. Although it can feel painfully disorienting, more screws may need loosening before we restructure. Practices that help us cope mindfully with this discomfort will move us forward with intention. Dismantling forms is a little like death. There is a period of time when what we used to understand and rely upon no longer functions. Things pass away. As grief-filled as this can be, we need this process. I once read a fantasy story that imagined what would happen if Death didn’t exist. It was a mess. There is a reason to dismantle and undo. If nothing else, it builds resiliency for change. This could be the greatest benefit of a Mercury retrograde period—to learn new skills for adapting to the unexpected. What is your take away from this mutable cycle? Sunday, June 22. If the prime directive of this Gemini lunar cycle and Mercury retrograde period (Mercury turns direct on July 1) is to dance with grace through the unexpected, then today’s Taurus Moon gives us pause. Wouldn’t it be nice if we could rely on at least a few things? As fixed earth, Taurus helps us orient to the immutable things of life. What are these for you? Everyone needs a pivot point around which the carnival of life can spin. Find yours today. A clue: Your body knows the answer. Give yourself the gift of pleasure. Return to the world of the senses. Take in art. Bake a pie. June 23—Balsamic Moon: Surrendering. I am noticing the dynamic tension between being in control and going with the flow. That’s a good way to describe the difference between the mutable energy still present in this lunar cycle and the fixity of the Moon in Taurus. The Balsamic phase of the Moon is the time of letting go. In a way, this is the mutable portion of the whole cycle. This pattern repeats in many ways through the beginnings, middles, and endings of our lives. I am wondering what it means to be good in the end. What is most helpful? Is there anything left to be undone and surrendered into the process of completion for this lunar cycle? Tomorrow the Moon will reenter Gemini. That shift helps us notice the ways mutable air energy moves in our lives. Learning, conversation, connecting the dots …. all these things represent the Gemini gift of pollination, adaptability, and breezy curiosity. Today, Venus leaves Taurus for Gemini. Notice how the sociability quotient goes up. It doesn’t last long, however, Venus leaves Gemini on July 18. With Mercury moving backwards through Gemini as it continues to retrograde, expect synchronicities and strange coincidences to increase. Tuesday, June 24. The screws are loosening; forms have already mutated and continue to do so. Expectations are shifting. We’ve each had to redo at least one thing since this mutable lunar cycle began. Most likely, if we thought about it, we’d see a lot of things we’ve had to do over. No big deal. But after a while, something shifts inside us. Without knowing it, we’ve cleansed ourselves of over-used patterns and we wait for the next imprint to begin a new one. I characterize this state as between the worlds. Not quite in the old, not quite yet in the new. As the Moon in Gemini contacts Venus in Gemini and Neptune in Pisces, how are you noticing this in-between space? How are you using it? Wednesday, June 25. This is a firecracker of a day. Mars opposes Uranus (for the third and final time since December). Mars has a way of animating Uranus. Or perhaps it is the other way round. When both of these planets connect in this way we can expect shorter fuses. More booms. But we may also experience a release of tension through dramatic action or decision. Sometimes we need a push. What can you mindfully change in your life to honor the Uranian desire to be free? Slow down and be a little more careful today. Hopefully this aspect will not manifest as more violence in conflicted areas of the world. Here’s a question to ponder, how do we help cool down these situations without creating more conflict? That is an experiment worth pursuing. Wednesday, June 26 After contacting retrograde Mercury early this morning (CDT), the Moon drifts into a void-of-course period until it enters Cancer in the late afternoon. We drift a bit today as we let go of an entire lunar cycle. The New Moon tomorrow is an opportunity to begin again. I think of the Gemini lunar cycle as the season of pollinators. Give thanks for the real and metaphorical pollinators in your life. These pollinators bring in new information, new ways to connect and share. Honor the possibilities that have opened before you. Let go of having to grasp it all. June 27—New Moon: Dreaming. The Cancer New Moon calls us to step into the ease and flow of summer (in the northern hemisphere). Summertime is when “the living is easy,” but that doesn’t mean it is easy to let ourselves embrace ease. Even so, I believe magic happens when we align intention with the call from the Moon. With this magic we can better see what we need. We can mindfully and lovingly invite a change in the way we treat ourselves. We can receive the blessing of water, the elemental signature of Cancer, to release patterns, tenderly wash our pains and wounds, and quench our thirsty souls. Water is an ally for gentle as well as powerful transformation. I’ve been thinking recently about rivers, currents, and oceans as three symbols for the water signs. Cancer’s affinity for family reminds me that a river is a family of many streams. Each time a stream joins the river, the river becomes more powerful. Its flow increases. The strong current gorges out deeper channels through the earth and becomes, like Scorpio, transformative. Finally the river meets the ocean at the river delta, where all these many streams and powerful currents diffuse into a broad area of swamp and marsh to join the Pisces ocean of being. So, to join the river is the beginning of a powerful journey—a Cancer journey. The time of Cancer invites us to recognize where we have come from and where we belong. The river is built upon our pasts, is changed by present choices, and carries us all into possible futures. The magic of the river is to be in the flow of this becoming. The chart for today shows the stressors we’ve been living with for a while—Mars opposes Uranus, with Pluto squaring them both. This t-square of planets in cardinal signs impels us to take action, especially around the issues of power, justice, and authenticity. After a cycle of mutability, which has not entirely gone away since Mercury is still retrograde in Gemini along with Venus in Gemini and Chiron and Neptune in Pisces, we’ve still got plenty of new information to integrate as we prepare to take action. The Sun and Moon in Cancer along with Jupiter in Cancer play a big role in guiding these actions. Jupiter is significant because it will leave Cancer during this lunar cycle to spend about a year in the next sign, Leo. After a year of transiting Cancer, Jupiter has expanded our capacity to know what we care about, to recognize the importance of home and family, and to investigate the ways we nurture. When under stress, one Cancer response is to get protective. The root cause of this protectiveness is a desire to help the river flow strongly to the sea. Can we be both protective and open to the flow? We get to explore such things this lunar cycle. Saturday, June 28. Cancer is one of those signs that get typecast into one thing—nurturing. Then, we dismiss the importance of nurturing and Cancer is left with one note, and not a very respected one. What is the awesome power of the cardinal water sign? Take a moment to think again about Cancer. Don’t underestimate the tenacity and ability of Cancer to get it done, whatever needs doing. We’re feeling a little activated today after the New Moon yesterday. The Moon squares Mars and contacts Jupiter. Big feelings are present, and why shouldn’t they be? How will you use Cancerian strength to get your needs met? 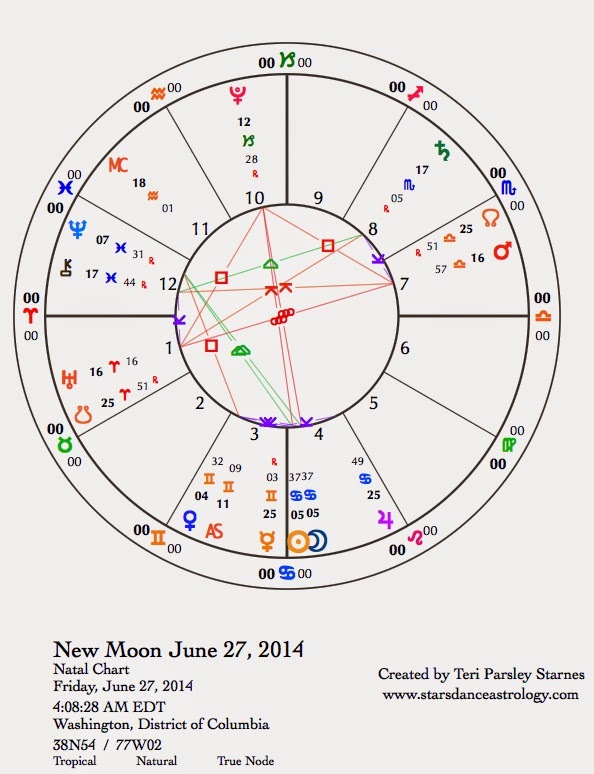 *The Gemini lunar cycle began on May 28 at the New Moon. Read more about the beginning of this lunar cycle on my Starsdance blog. Life’s been interesting lately, hasn’t it? Mutable signs have been loosening up the works after an early spring of tense standoffs during the grand cardinal cross transits. That is one of the functions of the mutable signs (Gemini, Virgo, Sagittarius, and Pisces), to move things along. These signs occur at the end of a season when weather patterns shift back and forth between one season and the next. Mutable signs ask for flexibility and require us to improve adaptability skills. Mutable signs inhabit the in-between places where we hold duality and paradox. From this place, we can be quite clear and quite confused about our perceptions. The million-dollar question is: How do you tell the difference? The complexity of the transits of the last two weeks of this Gemini lunar cycle* has reinforced my appreciation for the complexity of human interaction. I am grateful for astrology in times like these. Astrology’s complexity mirrors our complexity. Astrology helps me appreciate how unique and complicated we are and how essential each of us is to the whole. Difference is necessary, even when our differences are sometimes hard to navigate, such as during Mercury retrograde. Another gift of mutable signs is an ability to let go of a fixed point of view. This can feel like being wishy-washy at times, but it can also feel like being a peacemaker and a co-creator. Have you noticed these types of shifts occurring this month? This Gemini lunar cycle is halfway done. The waning phases of the Moon invite us to assess what we are learning from the first part of the cycle. Since mutable signs are about learning and synthesizing, this impulse may seem even stronger the next two weeks. Influential transits of the next week include these hightlights: Mercury retrogrades back into Gemini, mixing up the messages and asking us to be even more patient as we learn new perspectives; Sun and Mercury come together in the inferior conjunction on the 19th, offering insight into learning and perceiving styles; Chiron stations retrograde in mutable Pisces, adding a strong influence of emotional sensitivity to our perceptions; and the ingress of the Sun into Cancer at the Summer Solstice, shifting the focus away from perception and into action based on what we have learned. Sunday, June 15. Yesterday may have felt a bit tempestuous. Today, we make use of the Aquarius Moon to get some perspective on emotional experiences. This would be an excellent day for fathers and children to visit a science museum for Fathers Day. Don’t expect others to show you their sensitive sides, we been through enough of that lately. More of that will come this week. Enjoy a breather. June 16—Disseminating Moon: Sharing. Truth becomes toxic when we over-attach to our beliefs. Truth becomes a healing force when we welcome it as a visitor. Thinking back over the lessons in perception you’ve experienced the last two weeks, what kind of truth do you want to take away? This is the phase of the Moon where we share our insights, our revelations, our wisdom. Every one of us has a truth to share. That is abundance. Venus in Taurus reminds us that we dwell in abundance. The Moon in Aquarius and Saturn in Scorpio add to the complexity of achieving that awareness. Notice feelings of scarcity and judgment. These can be transformed by embracing a light-hearted approach to truth. Many things seem possible today. Take a chance. Tuesday, June 17. Mercury, still retrograde, moves back into Gemini, where it remains for three and a half more weeks. Keep rechecking your facts and what you think you’re hearing in communication with others. Midday (CDT), communication issues clear up for a while when the Moon trines Mercury. Take note of inspiration and insights because we dive back into the ocean of Piscean feelings by the afternoon. Good to give yourself time to take in the information important to you and let go of the rest. Wednesday, June 18. Were you having wonderful dreams as you woke this morning? While we slept (in the CDT) the Moon contacted Neptune, and Venus in Taurus formed an encouraging connection with Jupiter in Cancer. Chances are good that some resolution happened during those vivid dreams. Feeling more grounded and confident, let this feeling carry you into your day even if you can’t remember your dreams. With the Moon in Pisces making favorable contacts with Pluto and Saturn later today, we are able to acquire strength and stability even in tricky emotional terrain. June 19—Last Quarter Moon: Evaluating. Maybe this is your reality too, does it seem like you’ve been on a mutable sign roller coaster during this lunar cycle? Has it been a challenge to adapt to fluctuating information coming from a variety of sources? Putting aside the challenges you may have encountered, what have you gained in the experiences of the last three weeks? Sometimes the most challenging interactions give us the biggest gifts. Early in the day (CDT), we feel expansive. The Moon in the final degrees of Pisces favorably contacts Venus and Jupiter. With a strong sixth sense, we just know the answers. Is it possible to hold onto that confidence while at the same time question the information? Certainty and curiosity can support each other if we practice dual awareness. Later in the day, the Sun and Mercury come into an inferior conjunction. This is a seed moment of insight into what this Mercury retrograde cycle is teaching us. Possibilities include, expanding our point of view, synthesizing contradictions, and if nothing else, remembering that a sense of humor goes a long way when we’ve reached the end of our capacities. Friday, June 20. Emotional vulnerability may erupt as angry reactions today. Chiron in Pisces stations retrograde while the Moon in Aries contacts Pluto, Mars, and Uranus through stressful aspects. It could take all we’ve got to remain compassionate and not turn our disappointments into retribution. So, how do we step back from reactivity? The very trigger of the Chiron station may also be our greatest resource. Chiron in myth was a great teacher. As half horse and half man, he embodied paradox and the ability to synthesize extremes and differences. He also faced his greatest challenge through an unhealable wound that initiated him into even more service. The challenges we are facing call for such qualities in our selves. Who are the teachers in your life? What are you teaching others through service to intention? Hold tenderness towards self and others. Saturday, June 21. Summer Solstice. The Sun’s ingress into Cancer today represents a foretaste of the Cancer lunar cycle that begins on June 27. We’ve still got one week to synthesize and release the Gemini cycle. In the rhythm of the year, every mutable sign is followed by a cardinal sign. The mutable season helps us let go of the past, orient ourselves to present information, and then hands the task over to the cardinal sign to initiate new action in response. Cancer’s supreme goals center around nurturance. Although Cancer can go out of its way to tend to the needs of others, that is not all this sign is capable of. Fierce protection, excellent management skills, and a reliable assessment of survival needs are also expression of Cancer’s nurturing character. A good place to start in helping others is to help our selves first. Notice where you need self-care and be fierce about providing it for yourself. The Moon enters Taurus after the Sun’s ingress into Cancer; feel the earth welcoming us to sustainable action. Feel the strength of knowing what you need. It isn’t true that oil and water can’t mix; they just resist it. We must apply effort to get oil and water to share their qualities with each other. But when we apply the right process the results are usually well worth it. Something new is created. So, what does this have to do with this week’s astrology? During this mutable Gemini season*, I am noticing different energetic bodies within my own body and how these energy states don’t always blend effortlessly. And blending isn’t the only problem; it can also be hard to shift between them. For me, the work of the remaining Gemini lunar cycle will be to attune to these energy states and find easeful ways to move between them and to synthesize them. Mutable signs (Gemini, Virgo, Sagittarius, and Pisces) have an innate talent for perceiving subtle and gross energy states. They are the perceivers and synthesizers of the zodiac. Mutable signs are very good at sensing through their particular elemental filters. Gemini, being an air sign, emphasizes mental perception. Pisces, the mutable water sign, senses through emotion. Sagittarius, the mutable fire sign, through energy and motion. And Virgo, the mutable earth sign, processes information through the physical realms. Being sensitive, the mutable signs can also be prone to absorbing energetic fields around them. All mutable signs benefit from self care regimens that help them center and release information overload. Not all of us have mutable sign emphases in our charts, yet during this lunar cycle, it is a good idea to be mindful of this tendency. Air perception styles are emphasized this lunar cycle. The New Moon in Gemini sets the tone. Mercury, the ruler of Gemini, stationing retrograde from Cancer back into Gemini, adds zesty spice. Mercury retrograde cycles give us the opportunity to see from a new perspective. Some questions to consider: What is the nature of your mind? How do you clear your energetic channels to keep your perceiving mind open and receptive? What do you do with the information? What is useful? What could be let go? Back to the mixing of the energy-body states. During stressful times, we can get stuck in one mode of perception, forgetting that other ways of knowing are possible. If feeling stuck, sense into another energy body. Air body—what thoughts keep returning? What feels hard to grasp? How important is it to understand? Look to the other elements. One gift of air is perspective, what is the big picture? Water body—are emotions overwhelming? Do you feel a strong desire to isolate from others? Do you feel stuck in one emotional story? Look to the other elements. One gift of water, empathic compassion for self and others. Earth body—are you over-focused on perfection? Do you desperately need to establish control in your life? Are setbacks causing you great discomfort? Look to the other elements. One gift of earth, taking small steps to wholeness. Fire body—are you experiencing a great deal of flight or fight reactions? Are your energy levels fluctuating too much? Are you attachrd to being right? Look to the other elements. One gift of fire, finding the joy that elevates our thoughts and feelings. We are always shifting between the elements. Sometimes we get stuck; sometimes we take up a gift from another element to help us move along. Notice those states this week. Find a new way to combine oil and water. Sunday, June 8. The square between the Sun in Gemini and Chiron in Pisces presents a chance to notice the interplay between air perceiving styles and water perceiving styles. The real challenge is to mix the two. Wouldn’t it be great if we could think our way out of every problem? Or maybe that isn’t true for you. Perhaps your inclination is to express your emotional truth. Chiron reminds us of heartbreak of the unhealable wound. The Sun shines a light on how uncomfortable that makes us. How do you shift between these ways of knowing? More water emphasis comes from Saturn in Scorpio. The Sun is quincunx Saturn creating even more desire to find the intellectual solution to emotional problems. It is all about investigating your natural tendencies and looking again with a new way of perceiving. If we remain stuck, we get caught defending positions we don’t really believe in. The trine between Venus in Taurus and Pluto in Capricorn, both earth signs, gives strength through the difficult passages of the day. The goal is to find authentic connection in our important relationships. June 9—Gibbous Moon: Perfecting. What has been your heart’s desire for this lunar cycle, which began on May 28? Or do you even know? Gemini, in its ever-mutating processes, doesn’t really help us stick with just one desire. Every day, every moment, can bring a new longing. This doesn’t mean we aren’t engaged in important learning, and it doesn’t mean we won’t achieve our heart’s desire eventually. Assuming we recognize it when it appears. The mutability of this mutable sign just might be driving us crazy at the moment. How do we perfect our intention (the keywords for the gibbous phase of the Moon) when we can’t even keep track of what we want in the first place? We are in the hall of mirrors at an amusement park today. We’re learning something even if it is only how to be amused at wanting to keep a firm grasp on reality when there is no such thing. Big news: Neptune stations retrograde today. This outer planet of dream and illusion makes this station only once a year. It is mirrored by the direct station, which also happens once a year. A planet’s influence is stronger at its stations. Neptune has slowly made it to 7+ degrees of Pisces and now retreats as slowly back to 4+ degrees of Pisces where it will turn direct in November. Boundaries may be non-existent for the next few days, so be mindful of your own core. The Moon in Scorpio, although in another water sign, helps us to remember an anchor to the essential self. What is your bottom line? The Moon is trine to Mercury (recently turned retrograde) and to this stationing Neptune. Mythic reality is potent. Communication takes an odd turn. How do you check out the stories you are telling yourself? Since logic is not much favored under this transit, use your intuition to navigate out of tough spots. But hold absolute certainty at bay. We just don’t know, and won’t know, what is up or down for a while. Tuesday, June 10. Although we are feeling fluctuating emotions due to Neptune and Mercury shenanigans (both stationing retrograde recently), we also find some grounding energy today. The Moon contacts Pluto, Venus, Saturn, and Jupiter in ways that can help us get to deep emotional truth and resonance. Notice where you need to put your energy. We are willing to commit to work that we feel gives us lasting benefit, especially if it supports our values and transformation. Wednesday, June 11. Another mutable day dawns. The Moon moves into the fire mutable sign of Sagittarius and also forms a challenging square aspect with just-stationed Neptune. See the introduction to this week’s column for more information about the different energy bodies of the mutable signs. Air, water, and fire are vying for our attention. The challenge will be to focus at all; the gift may be a new way to synthesize thought, emotion, and action. Chances are, the way will be unexpected and possibly confusing. Enjoy the process as it unfolds, if you can. 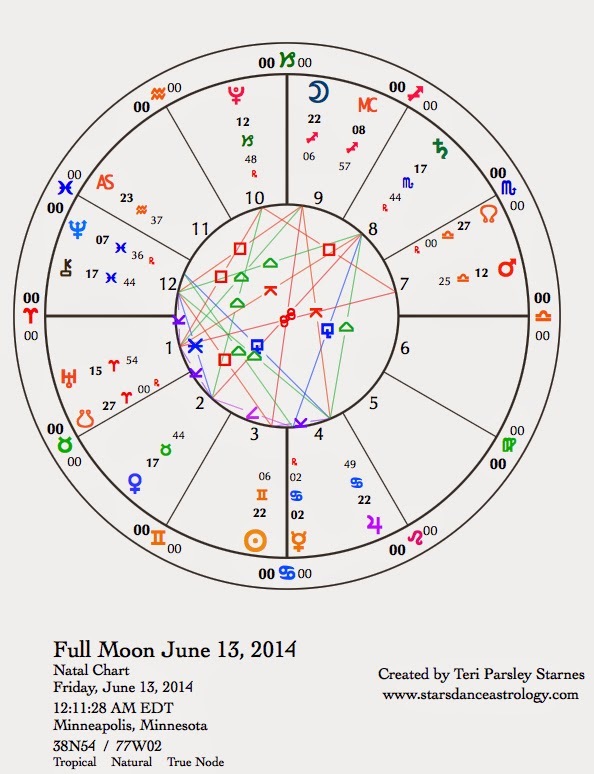 June 12—Full Moon: Illuminating. The Full Moon, which falls today in the CDT and tomorrow in the Eastern Time zone, represents a peak moment of integration for this Gemini lunar cycle. That’s the job of all mutable signs, to take in as much information as possible and weave it together. What I’ve noticed about the mutable genius is that this process comes without much effort. The mutable signs live in the energetic body of the elements: air’s mental processing, water’s emotional response, earth’ systemization, and fire’s exploration. Have you been more aware of your own energy body the last two weeks? An energy body, like the mutable signs, is subtle and quickly changing. When we are balanced and in the flow of mutable energy, we are uplifted, curious, and able to adapt easily. When we take in too much information or feel pressured to produce results with the information we take in, the nervous system can be overwhelmed. Times when the mutable signs are emphasized by transit, is a chance to notice how we run our energy and what we need to do to balance the systems. Interaction between mutable signs amps up the gifts and the challenges of mutability. The Sagittarius Full Moon pairs the micro-focus of Gemini air with the macro-focus of Sagittarius fire. It’s a head trip! We are inspired when we perceive both the pieces and the whole that comes from this pairing. The Sun and Moon in the Full Moon chart are square to Chiron in Pisces, giving us the input of water. Pure intellect and expansive energy cannot solve the complex problems we face. Tenderness, grief, and compassion play a role too. Sensitivity is strong now with another important feature of this chart: a Grand Water Trine between Chiron, Saturn in Scorpio and Jupiter in Cancer. This pattern presents the potential of deep emotional wisdom. But grand trines need to be stimulated into action. Venus provides that role. This grand trine is actually a Kite formation—a pattern caused when a planet opposes one of the planets in the trine and is sextile to the other two. Venus in Taurus opposes Saturn and is sextile to Chiron and Jupiter. Taurus is a fixed earth sign ruled by Venus; this is the anchor to the mutability and flow we are experiencing. I like to think of the Empress card in the Tarot when I imagine what Venus in Taurus wants from us. This card represents the power of the earth’s fecundity. The Empress invites us into our senses. From the body’s wisdom, we orient ourselves to our deepest values. Beauty is the guide and the anchor helping us expand our ability to perceive and integrate. That isn’t all. Mars, just recently turned direct, triggers the Pluto/Uranus square for the next two weeks. You may remember the tension of the Grand Cardinal Cross in late March and April. Any unresolved issues are revisited. The symbolism of direct motion describes the energy we may encounter: direct opposition, direct action, direct choices, direct consequences. The mutable lessons in perception and energy management will help us move forward with mindful intention. Friday, June 13. The Full Moon is still felt today. We are expansive and maybe jittery. Mercury retrograde makes this Friday the 13th just a little more interesting. What are the omens? Take them with humor and curiosity. We have choice even when we play with the idea that the cosmos is giving us messages. The Moon in authority-minded Capricorn opposes Mercury. Is there a conflict with someone in power? Are temporary setbacks to your ambitions making you doubt yourself? These are just lessons that ultimately will give you more mastery. Time to claim your authority. Saturday, June 14. Tension and conflict are present today. But that doesn’t mean there aren’t positives as well. Mars in Libra is square Pluto in Capricorn. The Moon in Capricorn, as well, joins the conversation. The issue may be authority vs. relationship. We are more sensitive to power differentials and injustice and some people will react. Goodness knows, we just may be seeing greater imbalance in these areas of U.S. culture than ever in our history. The gift comes from Pluto’s transformative power. When we claim personal power that is shared with others, we are stronger than the powers that hoard and deny. Do you believe that? I do.